Salted Bugles covered inside and out with melted white chocolate, a little dusting of cake batter mix and indulged with sprinkles galore! I’ve been on this Bugles kick, lately. The bag just seems to disappear before I even begin to mix it up with something sweet! Just like when I made the Caramel Brownie Bugles. Those were long gone before I could share them with the kids after school…or even with the neighbors! This time around, I got them out of the house and happily handed them over to little Easton’s teacher. She totally deserved them! 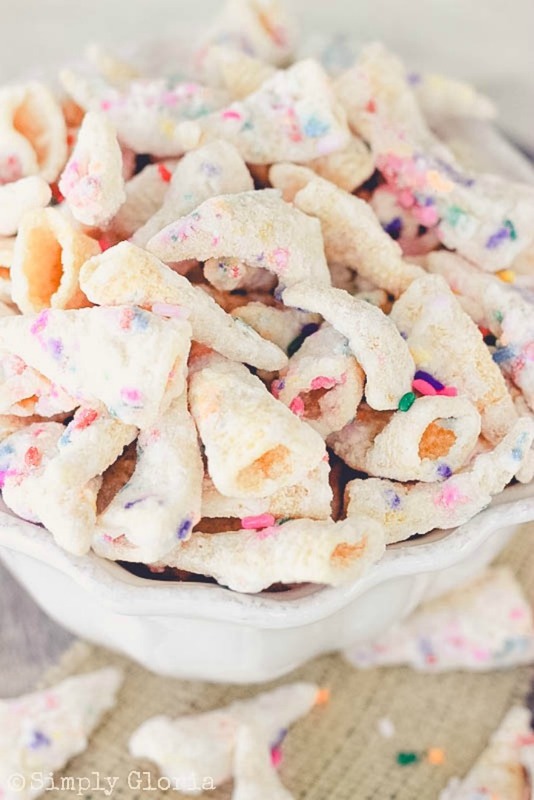 These Funfetti Bugles are just like that… very addictive! Justin even devours these. And, he’s not usually into sweets. But, he was bummed I didn’t even put any aside for him before he got home from work. I couldn’t have these Bugle treats calling my name all day while I was trying to distract myself away from them! 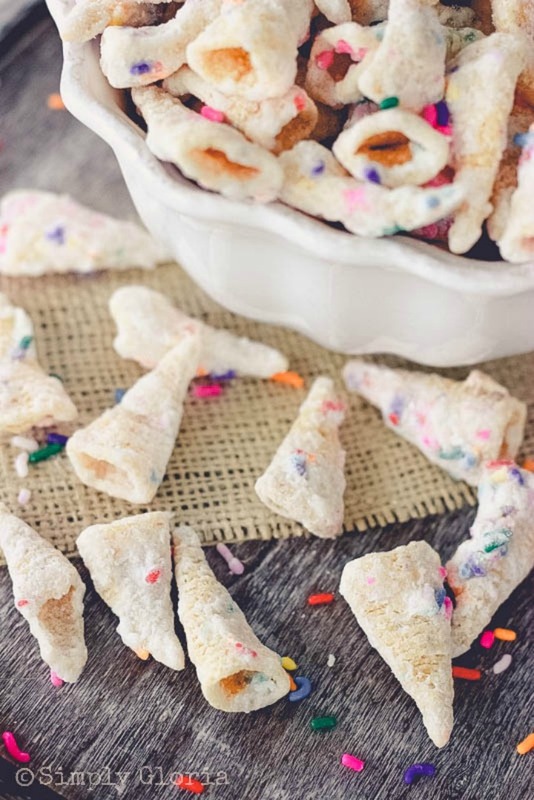 Funfetti Bugles are so easy and fast to make, you can have these available for your sweet n’ salty fix in less than 10 minutes! Put the Bugles in a large mixing bowl and pour the melted white chocolate. Immediately start to shake on the cake batter mix, along with the sprinkles. Use a large wooden spoon to gently mix and combine all of these toppings to surround each and every Bugle. You may want to switch and use your hands. Dump the mixture onto a large baking pan or a clean surface with wax paper to allow the chocolate to set up. It only takes a few minutes. Separate any Bugles that became best friends with another. No clumped Bugles allowed! There you have it, a fast sweet and salty snack is ready to eat right away! 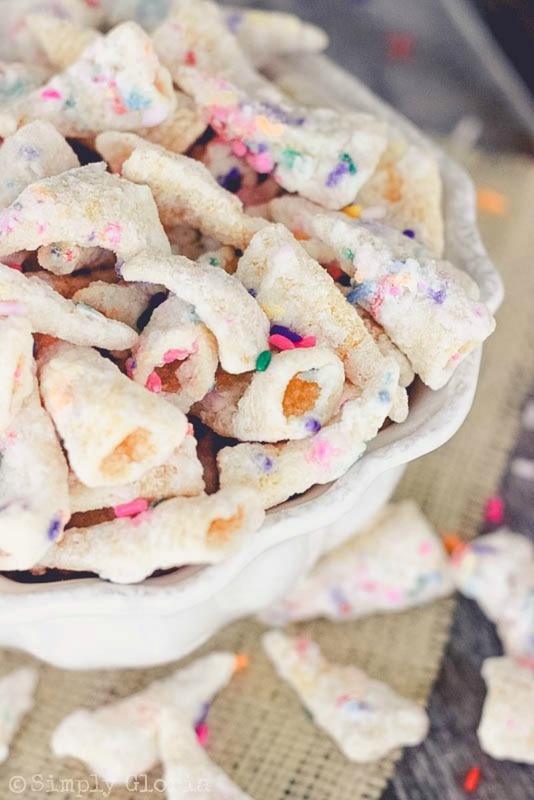 Salted Bugles covered inside and out with melted white chocolate, a little dusting of cake batter mix and indulged with sprinkles galore! Makes 6 cups. Melt white chocolate pieces over a double boil. Dump the mixture onto a large baking pan or a clean surface with wax paper to allow the chocolate to set up. It only takes a few minutes. Separate any Bugles that became best friends with another. 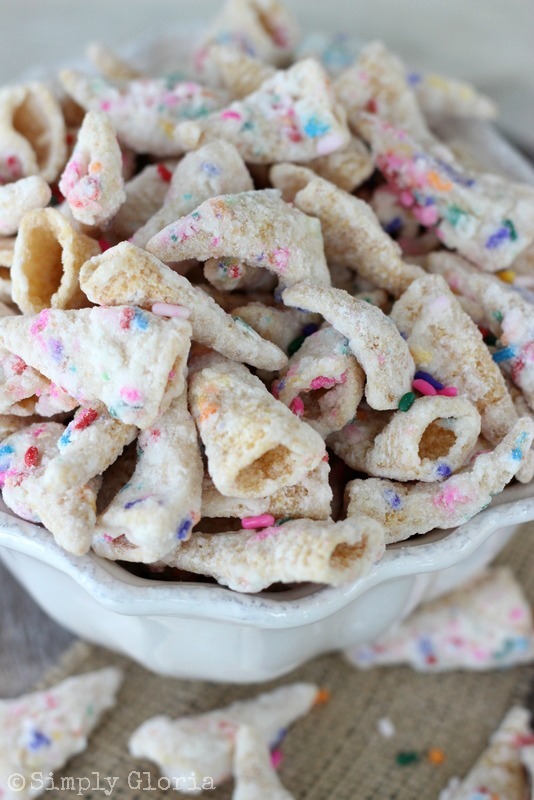 Pssst… I’m sharing my Funfetti Bugles recipe with these link parties… come join me! And… this recipe was just featured with Pin Me Link Party! 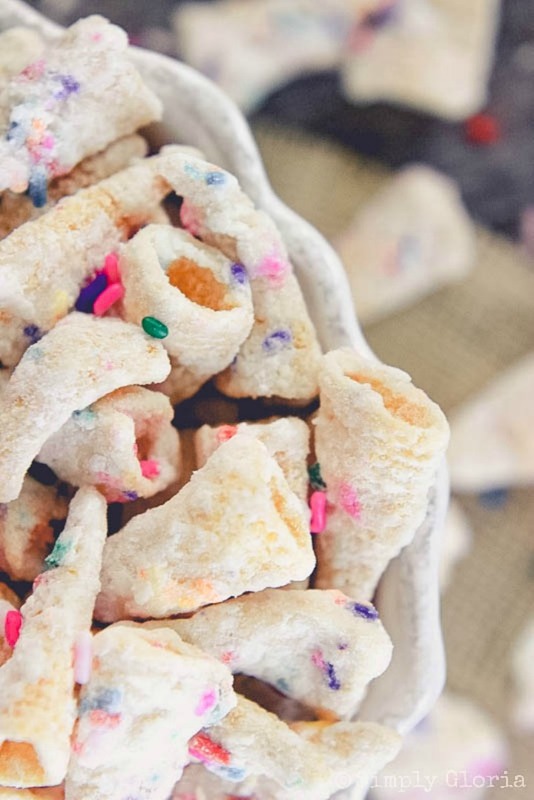 I love how you took a bag of store bought snack and made it into something so fun, tasty and festive looking Gloria! 🙂 Looking at these put a smile on my face. Pinning! Have a wonderful week! HUGS! Oh my gosh lol …… not that I need something like this around, but I totally want this! I can see how this could be so addicting! Pinned for when (I hope) I have more willpower to not eat the entire batch by myself! I could see these being very addicting in my house! These look so wildly good! I’ve always loved bugles, but I’ve never had them like this! 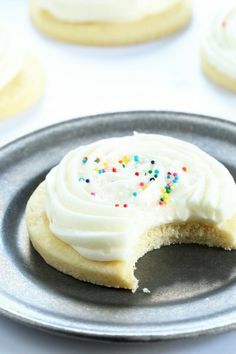 White chocolate and funfetti sound delicious! Thanks, Julianne! You’d love these for sure! Thank you, Elizabeth! You always make me smile! Gloria, these not only sound deliciously addictive, they look happy and pretty, too! Now I have to remember to add Bugles to my shopping list! 🙂 Thanks for the inspiration and pinning! Have a great day! I used to always buy the Bugles when my oldest was little. And, now (almost 20 yrs later!!) it’s my youngest one’s favorite. Especially when I add all the sprinkles. Thanks, Cindy! I LOVE Bugles! Have you tried the caramel kind? If a bag of those are open when I’m around…..I’m doomed. I’m darn certain I would eat this whole batch too! My boys are going to love these!! Sooooo, cute! Yes! The caramel are so my favorite! I get doomed, too. In fact, I blamed the empty bag on one of the boys when Justin asked who ate the “whole entire” bag. Oh, well. It’s the love of a mommy that can blame the children…hehe! I can certainly see how these would be totally addicting! I can only make this when we have an occasion where lots of people will be around or I’ll eat the whole batch! Gloria, I LOVE this idea. I am a huge fan of Bugles, and these are almost like puppy chow. Brilliant! I want to scarf huge fistfuls of the stuff! What a delicious twist on a yummy treat! Thanks for sharing. I cannot imagine photographing something like this because these will be gone in seconds at my place. Delicious and look how pretty they are with the sprinkles! That was so clever of you Gloria. I actually was snacking and snapping at the same time! Thank you, Sonali!! Oh how I love all of your Bugle recipes, Gloria! These are too cute! Pinned! Omg. What an awesomely amazing snack idea! What a great way to amp up bugles! Just made this for my daughter’s 6th birthday party that was unicorn themed and everyone asked for the recipe. I shared it on my FaceBook and wanted to thank you for such a great treat idea! Perfect for me to bring to her class as well since they ban peanuts and it’s hard to find something to send in with her to school. What a great idea– Unicorn themed party! I am so thrilled you loved this recipe and shared with your friends. It really is hard to find specific treats without nuts to the classroom. The kiddos would really dig these. Thank you! WOWOWOW! I am SO making these! Great recipe – thanks a million for sharing with us at Weekend Potluck…and thanks for the link back too. =) Have a super week. I hope you enjoy this treat as much as we do, Marsha! Have a great weekend! These look delish! Yum! Thanks for sharing this at our weekly Best of the Blogosphere linky party over at MerlotMommy.com. Such a fun idea—and they taste great! I made them for my four-year-old’s unicorn birthday party. A couple comments: I used white chocolate chips (as the recipe didn’t specify), and the chocolate was too thick to distribute evenly, and the rainbow bits in the cake mix did not show up at all (just the sprinkles). I did the best I could to spread the chocolate out (and melted it very carefully in my double boiler), but ended up making two batches and picking out the best ones for the party because a lot of them were just barely dusted with cake mix and completely without sprinkles (because the chocolate had clumped elsewhere). If I had more time (and hadn’t trashed my kitchen so badly making these), I would have tried again using the white baking chocolate. Feel like I’m joining the party a little late, but these look ADORABLE! So cute that I think we will be making them as a “snack” for our school production of “The Lion, the Witch, and the Wardrobe.” There’s a unicorn in the play, ya know!! OMG! Perfect winter time snacks! Adorable for Christmas. I made these last week as a tester for my daughters first birthday party next weekend and they are SOO good! Love! !